A killer named sludge may live in your engine and can choke the life from your car, regardless of maintenance or mileage. And the automakers whose engines are susceptible to sludge still aren’t always eager to help. Cleaning engine oil sludge (from any cause) can prevent engine problems and improve the performance of your vehicle. Sludge often forms when oil oxidizes and breaks down after prolonged exposure to high temperatures. The baked oil turns gelatinous and can block vital oil passages, which could lead to repairs in the thousands of US dollars or even an engine replacement. 1) Use a product to clean out engine oil sludge and varnish, such as AMSOIL Engine Flush. 2) Use a premium synthetic oil, such as AMSOIL, that resists the formation of sludge and deposits in the first place. AMSOIL Engine Flush is an excellent option for cleaning engine sludge and deposits to restore the efficiency of both high and low mileage mechanically sound engines. It is also recommended as a maintenance tool for preserving peak performance. AMSOIL Fast Acting Engine Flush is a carefully selected blend of solvents and special cleaning agents that dissolve and disperse harmful deposits formed in the crankcase, cylinder walls, pistons and rings of an internal combustion engine. It also aids in draining the contaminants and releases as much dirty oil as possible from the crankcase. When used as directed, it cleans and helps restore operating efficiency to valve lifters and piston rings for improved performance. When using AMSOIL motor oils, AMSOIL Engine Flush is only recommended when first switching over to AMSOIL. 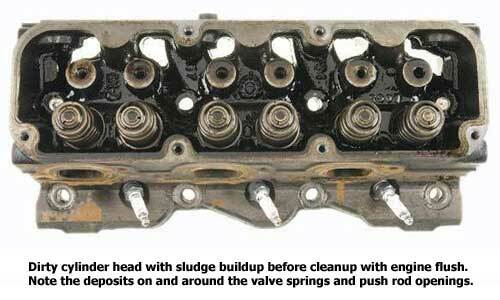 Using the engine flush (with the old oil) cleans out sludge and varnish that has built up in the engine. This ensures that you start out with a clean engine before putting AMSOIL in. AMSOIL will keep engines running very clean, so there is no need to use engine flush after switching to AMSOIL motor oils. In fact, AMSOIL will over time clean out much of the sludge and other deposits left by conventional oil. Thankfully you do not have to tear your engine apart to clean it out. 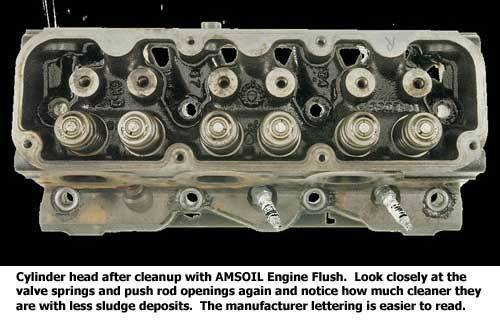 Using AMSOIL engine flush is so fast, so cheap, and so simple there is absolutely no excuse for having a dirty engine. To clean your engine to like new all you have to do is add one 16 oz bottle of engine flush to your oil fill port. It is best to add it to an already hot engine to get a really good cleaning. You are going to do this right before you change your oil so be ready with an oil filter and enough oil. After you add the AMSOIL engine flush to your existing oil then start your engine and let it idle for 15 minutes. That 15 minutes of hot oil circulation with the engine flush is going to dissolve and clean out a lot of engine sludge (as shown in the pictures above). After 15 minutes, shut your engine down drain the oil hot if you can safely and add some fresh clean oil and a new filter then enjoy driving around with an engine that is like new inside. If you are ultra conservative about your engine like I am then for the first engine flush you might want to buy an inexpensive oil filter and swap out your old filter with a new one right before the flush and after the flush change the filter out to a high quality long life filter. As you will see AMSOIL Engine Flush is a very inexpensive and effective way to do a virtual "high temp powerwash" of your internal engine components. As you may already know finding AMSOIL Engine Flush locally can be a challenge so the easiest thing to do is just order it online. The online website offers best price you could find anywhere anyway. but all you really need to know is if you are going to spend more than $50 you should sign up for the preferred customer program to get 20-25% off. 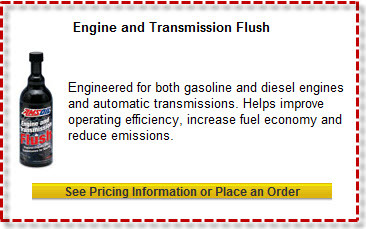 But since a bottle of engine flush is less than $10 right now and gas prices are about to go through the roof you probably should just click the link below and order right now because a clean engine is an efficient engine and an efficient engine saves you money at the gas pump. Synthetic motor oils are engineered, unlike conventional motor oils which are just refined after pumped out of the ground. As a result, synthetic oils generally hold up better to the high temperature conditions that create sludge and varnish in conventional oils. They should also be free of the contaminants in conventional oil that tend to form sludge and varnish. Consumer Reports has even indicated that synthetic oils can help with sludge problems. Unfortunately, not all synthetic engine oils are created equal. AMSOIL motor oils are proprietary formulations of the world’s best synthetic base stocks and most advanced additive systems. From the start, they prevent sludge and deposit formation, protect seals, reduce oil consumption and improve fuel economy. Not only does AMSOIL provide the best protection and performance, but AMSOIL is also cheaper to use than conventional motor oils!. A one-year oil change with AMSOIL typically costs $49 or less (before tax and shipping). This oil change lasts up to 25,000 miles. Think of all of the time and money you can save with only one oil change per year! What makes AMSOIL synthetic lubcricants the best? AMSOIL synthetic lubricants are much more stable in high temperatures than refined oils are. Their superior heat stability reduces formation of sludge and deposits, the rates of oil consumption, lubricant breakdown and lubricant oxidation. These benefits keep equipment clean, protected and running right as well as providing extended lubricant life - AMSOIL motor oils last one year (up to 25,000 miles!). AMSOIL synthetic lubricants remain fluid in temperatures far below zero, allowing dependable engine start-up, fast lubrication, dependable protection and maximum fuel economy in severe cold operations. AMSOIL synthetic lubricants are superior to refined oils in reducing friction, helping lubricated systems use fuel energy for work, not for overcoming drag. Superior friction reduction, as well as lower volatility rates, also helps keep exhaust emissions low. AMSOIL synthetic lubricants’ heat stability and friction- reducing ability keep wear rates low, which helps increase the time to first teardown, increases the interval between teardowns and increases overall equipment life. AMSOIL synthetic lubricants offer eight times the service life offered by refined lubricants, and sometimes even more. The long life of AMSOIL synthetic lubricants reduces costs, downtime, waste and environmental damage. Ted Pickul of Sarasota, FL drives a 1992 Geo Prizm with unusually high miles. As of February 2005 the Prizm had over 362,000 miles on only 15 oil changes and 31 filter changes. Pickul credits AMSOIL products with extending the life of his car’s engine. Pickul bought the Prizm new in June of 1992 and after 3,000 miles, converted it to AMSOIL 10W-30 Synthetic Motor Oil. Pickul also installed an AMSOIL 2-Stage Air Filter. Reinier drives a 2004 Dodge Ram. He uses AMSOIL Synthetic 5W-30 in the engine, AMSOIL Synthetic Universal Automatic Transmission Fluid in the transmission and 80W-140 Long Life Gear Lube. Reinier said the dealer removed all the Dodge transmission fluid and refilled the truck with AMSOIL ATF. “Within a mile or two I could feel the transmission was smoother and showed a difference in how it performed,” said Reinier. "I had heard a lot of good things about AMSOIL motorcycle oil used in Harley Davidsons, so I decided to try it out in my 2001 Heritage Softail with the Evolution Series Twin Cam Engine. I noticed right away that the top end of the engine quieted down and on the hot days I run 12-15 degrees cooler than all the guys I’m riding with. I don’t sell AMSOIL, but I recommend it after the improvement it made in my Bike." Just wanted to drop you a line and let you know that before I changed my oil I checked the average miles per gallon on my wife's Pontiac Montana via the on board computer and she was getting 18.1 miles per gallon. I then changed her oil to AMSOIL and installed the AMSOIL air filter and just let her continue driving it. I checked it about 3 months later and her average miles per gallon had risen to 21.1. So she gained 3 miles per gallon switching to AMSOIL. All AMSOIL products have been designed and made in the USA since 1972. That means the AMSOIL 25,000 mile oil change has been around for over 30 years with an excellent track record. AMSOIL has quality as a number one priority and develops all of its products to assure value is created for their customers. That’s my kind of company. Upgrading to AMSOIL products is easy. If you are looking to solve differential issues and provide the best protection for your vehicle you can order online here Order Now . I know finding the products for your vehicle is difficult enough at the auto parts store and spending a lot of time searching through a website for your specific parts is probably not very appealing. You receive catalogs, color brochures, ordering information, parts details, and equipment recommendations shipped immediately and directly to you from licensed Mechanical Engineers at no charge. This is an exclusive opportunity from the largest group of licensed Mechanical Engineer independent AMSOIL dealers on the web. AMSOIL ships directly to you, so it is convenient, but assembling the initial order can be confusing and time consuming. We make it easy and save you time by providing a list of everything you need for your vehicles and equipment. So please, the more detail you provide on the condition of your vehicles the better the recommendations we can make. AMSOIL is Premium Quality Synthetic Oil and You Receive Premium Service. Our goal is to answer all of your questions and match you with the best products for your vehicles and equipment. We want to provide you prompt high quality service to match the quality of the AMSOIL products we sell. Don’t let this unique opportunity pass to learn about wholesale pricing (25% off). Don't delay, request your free no obligation information package now. We will rush it to your door! With that you can order and AMSOIL ships directly to you via UPS (typically within 3 days). Although we are based in Kansas City, we enjoy helping customers all around the country!